Rubenerd: Traffic jams in the 1950s didn’t tell us? Traffic jams in the 1950s didn’t tell us? Seems like even as early as the 1950s we knew we couldn't just keep building cars to solve our transport problems, but our own laziness, greed, sense of entitlement and ultimately short sightedness means we're still dealing with these problems at the start of the 2010s. Whooptie do. 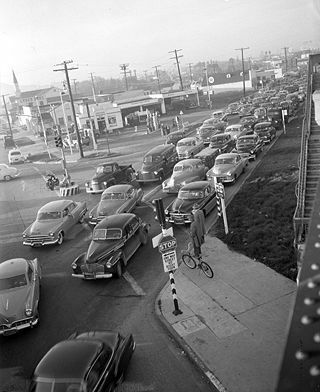 The photo depicts a "Traffic jam at Venice Boulevard and La Cienega Boulevard in Los Angeles, Calif. in 1953", now in the public domain in the US. I get the feeling my favourite honorary (is that the right word?) Canadian Todd Tyrtle would have something to say about this too!